Fabric & description: 100% Jersey Cotton. V-neck, crossover front, 3/4-length sleeves, a knee length, attached self-fastening waist tie. Its a lovely wrap dress decorated with a black orange summer graphics print. Wearable with wedges, or smart shoes. 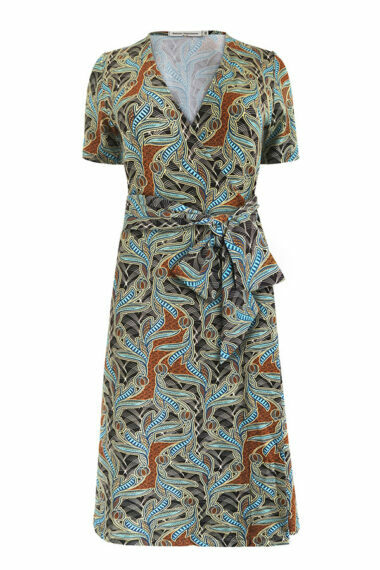 Its a perfect and classic dress for your all spring/ summer occasions. Machine wash at 30 degrees. Nathalie Vleeschouwer manages to combine femininity, sensuality, wearability and comfort perfectly in her designs. As a result, the range appeals to self-confident women with strong personalities, who want to look elegant and are not afraid of colour. The collection is made in EU. We have been selling their collection for 6 years in our shop online and Pop Up Shops.